Rachid's riad is a spectacular place with a wonderful view of the High Atlas. He was helpful in many ways and arranged a half day trip to Tioute, a small town about an hour away with much to recommend. The riad has 4 lounging areas in traditional style and is very tastefully decorated. I hope to return some day for more of Richad's hospitality. My 3-day stay in Taroudant was one of the highligts of my tour of Morocco. This a beautiful Riad with a tasteful furnishing, great details in design. Each room has its own character. A very nice breakfast, dining and "sit together" room with a fireplace for the wintermonths. Nice area and garden to sit outside for sunset. Its just a 10 minutes walk to the inner old city. Rachid and his staff are great hosts. He tries hard to satisfy every wish. Riad recomendable al 200 por 100. Es nuevo y decorado con un gusto esquisito. Rachid está siempre atento a todo lo que puedas necesitar. En una zona tranquila, a 15 minutos andando al centro. Enhorabuena Rachid!!! De riad doet veel denken aan Marrakech, een oase van rust. Bedankt Rachid voor de tips en je gastvrijheid. Zeker voor herhaling vatbaar!. I recommend Riad al ouad to all people who stay in the area of Taroudant. I experienced the marrocan household in a hotel wich made me very amazed. 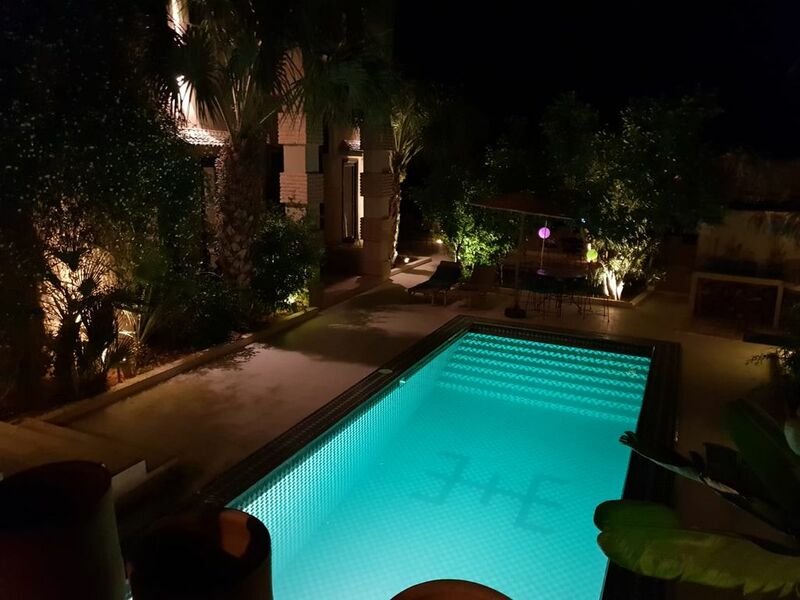 Behind the pool you can see the beautyful mountains of Taroudant. The food was delightful. In general just great! Thanks for the great service. This villa enjoys a privileged location that will allow you to enjoy your stay in the area. Many activities await you in the surroundings, such as Hiking, Rock climbing and Mountain biking.